I have never owned a “best” iron. Maybe I am too picky, but I always manage to find something wrong with any iron that I purchase. The iron I currently own sticks to some fabrics. The steam function also does not work very well. I find that sometimes I need to swish the iron around to get it to work properly. The water compartment is also very strange. First of all, the hole is too small and slanted. When I pour the water in, it slides down the sides and only about two thirds of it makes it into the well. The plug is also annoying. It is a self-retracting cord. At first glance, I thought that this would be a good feature. I suppose it is, for the most part, when it is working properly. But the other day, it would not come out. If it failed to retract, I wouldn’t have minded as much. But to fail at coming out, that is a real problem. I must say that one good feature is what Sunbeam calls the Storage Strip. This is a little heat sensitive strip located at the base of the iron which indicates whether or not the iron is cool enough to put away. I do like that feature. The wetting feature, is also nice, but I don’t use it very often. The buttons for both steam and wetting are located at the top and are handy but the steam doesn’t work properly. I push the button and no steam comes out. I also set the iron on steam and it doesn’t work on it’s own. Why don’t I take it back to the store. Because, honestly, I don’t iron very much. For the few times that I do iron, this iron is perfectly fine. Just as long as it heats and takes out a few wrinkles, I’m ok with it. We have had this unit for several years and can only say how much we like it. an exploded view could be included. I've had it about a year. It heats well, but drips worse than any iron I've ever had. Talk about false advertising! It has a design flaw. The plastic cover flap over the water well has a raised lip, probably for easier lifting. But this opening allows steam to condense and run off the iron. I've tried to find a way to blot it on the iron, but everything becomes quickly saturated and drips. I've resorted to dry ironing with a spray bottle for misting. Bummer. I have had this iron for less than a year. Problems from the beginning. Today is the last straw! The main problem is that it leaks brown rusty water all over the ironing board and my clothes. This is not the first time. Another problem is that it is very difficult to fill as the water hole is too small and the cover is cheap plastic and leaks around the lid. Most of the water runs down the side. I bought it because SUNBEAM has been around along time. Thought it would be a good iron! Should have read the reviews before purchase. Seems the problems with this iron are very consistent. DO NOT PURCHASE THIS IRON!!!! I have owned this iron for a short time and it also leaks brown nasty water all over my ironing board cover as well as the item I am ironing. It has ruined a number of clothing items. This iron was never tested prior to putting it on the market. Quality control definitely failed. I have rust residue on the bottom of my iron due to the leakage during the steam process and I have only used it a few times. I am very dissatisfied and would like to have a refund. . . . . .what about it Sunbeam. . . .$34.00 up in steam. . . . . I have owned this iron for approximately 5 years and it now leaks all over everything. I've tried to adjust the settings, but nothing works. Please consider buying another iron. I have one of these and it drips as bad as any other iron. This is my third one in this series and all dripped. You would think I would learn not to keep buying this but I haven't been able to find anything better. leaving all of thee 'drip' lines on the garments and I could not put them in the closet this way because they were 'damp'. I didn't take it back because I needed something to use. If you know of any iron that works properly, i.e. steams when you push for steam, and all of the other problems that others have stated, please post a BLOG in order for myself and others to pick up on it. I have just opened my iron and I don't have the instructions to it. There are lots of little buttons on top that I can't figure out what they are and the buttons for steam gushes out on my clothes. I'm not happy with it so far!!! Trying to find an instruction booklet so I can figure out the buttons on top. I do not recommend this for any woman that loves her iron!!! I am very disappointed with my iron as well. Although it worked great for years; just recently, maybe 8 months ago I noticed that it was always water everywhere, the ironing board and the clothes is always soaked. Water is coming out from everywhere. I guess it's not meant to last. So I have finally decided to chuck it and search for another perfect iron. Mine drips too. It was good for awhile and now the water streams out. Last time I will buy a Sunbeam. This iron is the best one I have had yet! It works great and is safe which is important since I have a small child. Even though I wouldn't leave my daughter alone with the iron on alone, It eases my mind that the iron shuts off after it is not moved for a little while. This is also great to prevent fire or your clothes burning. I really like that feature since safety is very important to me when looking for something like this. Also, it shoots out steam, so it definitely works great and gets all the wrinkles out of my clothes. It is also so easy to refill. To refill it it takes less than a minute, very quick and easy! 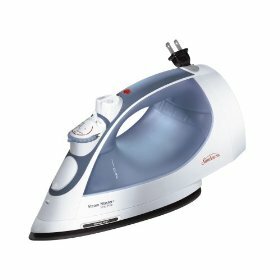 I would recommend this iron to anyone including my family and friends for sure. Two little extras that it has are a gripped handle for comfort (always nice) and a retractable cord which I have never had with an iron before. It's so nice to not have to wait for the iron to cool down and then wrap the cord all around the iron to store it. Overall this a great iron and I recommend it one hundred percent to anyone looking for a safe and good working iron!